Linklaters has become the fifth and final magic circle law firm to reveal its autumn retention score. From a qualifying cohort of 59, the global giant today confirmed 43 soon-to-be-associates will be staying put. This hands Linklaters — the largest training contract provider in the City, with 110 positions annually — an autumn result of 73%. Indeed, the Silk Street outfit is a strong retention performer, especially given the size of its trainee intake. In the past three rounds it has chalked up results of 84% (43 out of 51), 84% (47 out of 56) and 86% (44 out of 51). So what can fresh-faced associates expect to receive in terms of remuneration? 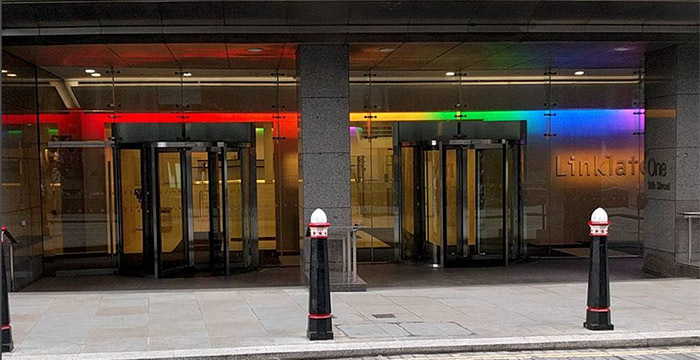 Well, Legal Cheek‘s Firms Most List shows newly qualified (NQ) lawyers at Linklaters’ London headquarters will start lawyer life on anywhere up to £90,000 (base salary and performance bonus combined). Trainees earn £43,000 in their first year, rising to £49,000 in their second. In our Trainee and Junior Lawyer Survey 2018–19, the firm scored A*s in training, peer support, perks and canteen (the same canteen that features in our Legal Cheek Awards video), as well as As for quality of work, tech, office and social life. The City outfit scooped a gong for its perks in our awards ceremony earlier this year. Linklaters is the final magic circle law firm to reveal its autumn 2018 retention result. How does today’s 73% result stack up against its rivals? Clifford Chance was the first of the elite fivesome to reveal an autumn score of 77%, confirming 36 of its 47 NQs were staying put. Meanwhile, Slaughter and May announced a result of 86%, keeping 32 of its 37 qualifying trainees, and Allen & Overy posted a rate of 80% (37 out of 46). Finally, Freshfields confirmed 34 out of 41 rookies had put pen to paper on permanent deals, handing the Anglo-German giant a score of 83%. The post Linklaters rounds off magic circle autumn retention season with 73% score appeared first on Legal Cheek.